When Cat spies mouse, he grabs him and tells him he is going to gobble her up. But being a feisty mouse, she disagrees and asks, “Why would you do that?” And so begins a back-and-forth conversation about the fairness of bigger being allowed to eat smaller because “that’s the way it is”. Mouse, who must be terrified, nevertheless has courage and tries to convince Cat that it would be better to be friends, but Cat is not interested until along comes D-O-G! Told entirely in conversation with different coloured text identifying each speaker, this is a charming story about assumed power invested by size – just because you’re bigger doesn’t make you in charge – and it will promote discussion about whether being little means giving in or having rights. Is Cat (or Dog) a bully? Mouse’s arguing against the status quo is very reminiscent of little ones who feel injustice keenly but who don’t quite know how to get something sorted, although they are determined to win and make their own world fairer. Having the courage to speak up for change is a big lesson in assertiveness, and while parents might end the conversation with “Because I said so!” it is nevertheless a sign that their little one is maturing and gaining independence. The illustrations are divine – set on a white background, all the emotions and feelings are contained in the animals’ body language and facial expressions that even without being able to read the words for themselves, very young readers will still be able to work out the story and participate in that crucial pre-reading behaviour. Don’t be fooled by its apparent simplicity – this is a thought-provoking read that we can all take heed of, regardless of our age! This entry was posted on August 9, 2018, in Animal Stories, Bullying, Cats, Courage and Determination, Dogs, Emotions and Feelings, Friendship, Philosophy, Picture Book, Preschool, Review, Teaching Resource. Mrs Vandenberg sets her 5th grade class a poetry project and then says, “Pick a partner.” Within seconds the only one left for Irene is you-never-know-what-he-is-going-to-say Charles and for Charles it’s hardly-says-anything Irene. But that’s not the main difference they see – Charles is black and Irene is white. Nevertheless, an assignment is an assignment and with no boundaries they select everyday topics like buying shoes, their hair, going to church and the beach to write about, each using blank verse to describe their experiences. For Irene who is painfully shy and likes her “stringy, dishwater, blonde” hair because it’s a curtain she can hide behind, her first poems focus on how she would like to be like the popular girls in class. “I’d rather be sun-burned than sugar-sand white.” For Charles, for whom words fly off the page and out of his mouth, they’re about how he too, would like to fit in better but is shunned because of the colour of his skin and the confusion that that sets up inside him. But as they write and share their poems, the topics getting more personal and revealing, gradually a greater understanding grows and they realise they have many more similarities than differences, seeing each other as individuals, and that they are both so much more than black and white. However, the poems don’t just explore their growing connections – they also explore their personal conundrums. Charles watches the news and sees people walking by as black people are being “choked, pummelled, shot, killed by police officers” and yet he has a special friendship with local (white) Officer Brassard; Irene is shunned by Shonda in the playground but when Shonda presents her family tree draped in chains, Irene feels the need to say, “Sorry”. Subtitled, Poems of Race, Mistakes and Friendship, this book grew from a friendship that began as an email but evolved from all that had gone before in the authors; and illustrators’ lives to shape them into their current personalities. Imagining what it would be like if they had met in a modern-day 5th grade class, rather than a book of unrelated poems this one tells the story of an evolving friendship between two people with seemingly distinct lives, diverse experiences and different perceptions using the format of the poem to be the voice of each, and each shedding light on innermost thoughts that illuminate a path that few get to tread. Unlike other books with “we’re-all-the-same-on-the-inside” messages, this one tackles the issue of race head on so that conversations can be started and differences can be explored rather than ignored. Because even though we may be the same on the inside, all that has gone before us even before we are born has gone into the making of who we are now, and while that makes us unique individuals regardless of skin colour, it is that skin colour that can be the greatest division as first impressions are so deeply shaped by existing attitudes, perceptions and preconceptions. Charles was picked first for the basketball team simply because of his skin colour and lanky legs, but things changed when he muffed an easy shot. This is a complex book with so many layers that it risks being left unopened on the shelf if it is not shared with the child by an astute adult, either parent or teacher, who can begin and sensitively guide the conversations. Cultural differences – racial, religious, sexual, lingual, socio-economic – are a big issue in our schoolyards as the focus on bullying demonstrates, so something new that approaches the issues in a radical way can be a catalyst for change. What is we were all Mrs Vandenbergs and set our students a similar challenge, instead of the one-size-fits-all novel study, and insisted that students work with someone they have never worked with before? If you are in an Australian school and would like my review copy of this book to use with your students, be the first to contact me and ask for it. Please include your name and postal address. This entry was posted on April 30, 2018, in Belonging, Bullying, Emotions and Feelings, Family Stories, Friendship, Growing up, Identity, Inclusivity, Older Readers, Poetry, Review, Self Esteem, Teaching Resource. Bobby was the last of Peggy’s litter of Australian cattle dogs to find a new home – some of his brothers and sisters had already moved to new homes – but he was OK with that because he was just a puppy. His mother consoled him and told him not to worry because he would find friends and “be accepted by others.” Because Booby was different. Instead of having the regular markings and patches of his breed, his face was plain. He didn’t know he was a bit different until the other cattle dogs at his new home, when a farmer finally came to claim him, wouldn’t play with him and this saddened him In fact it wasn’t until he befriended Mother Duck and she had him look in a pool of still water that he noticed the difference. Was he going to spend his life being different and alone? It would seem so until something happens that makes Bobby a hero and finally he is accepted for who he is inside rather than what he looks like. Based on a real dog and his experiences with other dogs, this story has a strong message of being accepted for who we are rather than what we look like. Bullying, in all its facets, is certainly at the top of the agenda in these weeks following the suicide of Amy “Dolly’ Everett and there are calls from all quarters for it to be addressed, with the brunt of the expectations falling squarely on the shoulders of schools. While the other dogs don’t nip or bite or otherwise abuse Bobby in what is the overt form of bullying, excluding him because of his looks is just as damaging and it makes a good discussion starter to raise the issue with young children so they can understand that bullying can take many forms and each can have unforeseen and unseen consequences. Written for young, almost independent readers, this is the first in a proposed series that is designed to teach young children to look beyond exteriors because “It’s what on the inside that counts.” There are teachers’ notes available as well as a plush toy that will give the story extra meaning. This entry was posted on February 6, 2018, in About Australia, Animal Stories, Australia: Story Country, Belonging, Bullying, Dogs, Early Childhood, Emotions and Feelings, Inclusivity, Mental Health, Mindfulness, Picture Book, Preschool, Review, Self Esteem, Series, Teaching Resource. Many schools are now including mindfulness in their curricula as they encourage children to check in on their own feelings and those of their peers in a bid to promote and protect positive mental health. This book, the 9th in this series, will be a valuable addition to the resources as it not only introduces the range of human emotions but also reaffirms them as being natural rather than positive or negative; demonstrates that feelings change; and that others might respond to a particular situation in a way that we don’t experience or expect. The latter point can be a tricky concept for little ones to understand as they are not yet mature enough to step beyond their own response to objectively look at others but the process can be started by having them compare food likes and dislikes so they begin to understand that there can be differences of opinion and that our personal experiences shape who we are and how we respond. 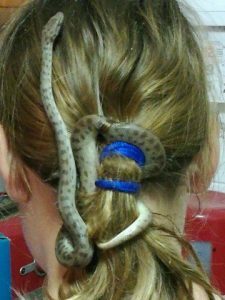 For example, a little one I know who is so totally in tune with nature has no issue with having her pet snake as her hair adornment whilst others will shudder because their experiences with these creatures are very different! But knowing and accepting that we all respond differently can be a step towards minimising teasing and bullying. Speaking directly to the reader, the authors not only introduce the more common emotions we experience but acknowledge that anger and sadness and apprehension are also natural and offer ways to deal with them so we can move on to a better place. They explain that other people can influence our feelings and even the way our body is feeling physically can have an impact. Who hasn’t been cranky when they’re hungry or have a headache or been in the sun too long? Any book that helps little ones understand and acknowledge their feelings and know that they are the body’s natural response to events and are part of who we are as humans is important in not only helping us to know ourselves better but also to know others and help develop both empathy and resilience, both important in combating bullying.. With its charming illustrations and personalised text, this could be at the core of your collection of mindfulness and mental health resources. This entry was posted on January 2, 2018, in Belonging, Bullying, Early Childhood, Emotions and Feelings, Identity, Inclusivity, Mental Health, Mindfulness, Non fiction, Picture Book, Preschool, Review, Self Esteem, Series, Teaching Resource. It’s a dark and snowy Christmas Eve so once again Santa wants Rudolph to lead the way for the sleigh as his nose shines bold and bright. But the other reindeer are jealous and not content with just laughing at Rudolph and calling him names, they are really mean and make him carry the heaviest loads, even using him as the ball when they played football! Rudolph is so sad and whinges and whines so much that the light on his nose goes out! With no reason to stay to help and full of self-pity, he leaves the comparative safety of the North Pole for somewhere where he is unknown and unrecognised. And there he meets some rabbits whose babies are lost in the forest and at the mercy of foxes and wolves. Completely forgetting his own troubles, Rudolph promises to find them – but can he do it without his shiny nose to light the way? Of course he does and with the rescue comes a realisation that is brighter than any nose could be! Written in 1954, this is the sequel to Rudolph the Red-Nosed Reindeer but unlike the original which May wrote to entertain children as part of a department store promotion, this one has a stronger message about there always being someone worse off than you, perhaps inspired by his family circumstances as his wife died from cancer as he worked on the original. While not necessarily the time for an in-depth discussion, nevertheless young children will feel Rudolph’s pain at being bullied and might think about the feelings of others that they tease. They will also draw encouragement from Rudolph being able to get things in perspective and go back to face his tormentors knowing that he is strong and has a lot to offer. This new release is stunning with its beautiful artwork bringing another dimension to the story, also told in rhyme, and making a special duo of books for the Christmas Countdown. This entry was posted on December 20, 2017, in Animal Stories, Bullying, Christmas Countdown, Christmas Story, Classic, Emotions and Feelings, Picture Book, Review, Self Esteem, Story-in-Rhyme. Wonder is the unforgettable story of August Pullman, an ordinary boy with an extraordinary face that has touched readers all over the world as it became an instant classic, used widely for one-school-one read projects and spread through word-of-mouth recommendations. Now Palacio has transformed the core message of that book into a picture book that transcends ages with its powerful theme. Even though he does ordinary things like riding a bike, eating ice cream and playing ball, Auggie is not an ordinary kid because he does not look like all the other kids in his class. He knows this and he knows they point and laugh and call him names which hurt his feelings. But he and his dog Daisy have a remarkable strategy for dealing with things when they get tough… And it certainly puts the hurt into perspective. Even though he knows he can’t change the ways he looks, perhaps he can change the way people see. Echoing the cover of the original, Palacio has depicted Auggie has a one-eyed child wearing a bright red t-shirt which stands out like a beacon against the more muted tones of the illustrations, somewhat like Auggie himself standing out amongst the masses. And for someone with no face, Palacio has nevertheless managed to convey a whole range of emotions in the illustrations and text. Every word does a job. In a book full of messages about belonging and acceptance perhaps the strongest one is Auggie’s inner strength. Yes his feelings are hurt but he has learned through his family’s love and acceptance of him as he is that he has the strength to endure, maybe even overcome the insults and prejudices. Even though he needs time out to heal, he has the resilience to come back stronger than ever. He knows he is a wonder, he is unique – but then, aren’t we all? Those who have not read the novel do not need to do so in order to connect to this book (although this one may well inspire them to seek it out) because it’s message is more important than the character. Every one of us is an Auggie in some way – try being a red-head with freckles and glasses in the 50s when Marilyn Monroe-types were the role models – so every one of us could be the central character. Written sensitively and with a light hand, particularly when it comes to Auggie’s solution, this book should be at the core of any program focusing on mindfulness, well-being, inclusivity, acceptance of others and being enough just as we are. Perhaps this book will, indeed, bring Auggie’s hope of changing how people see to fruition. This entry was posted on May 25, 2017, in Belonging, Bullying, Emotions and Feelings, Growing up, Identity, Inclusivity, Parent Library, Picture Book, Review, Self Esteem. Crickle, scratch, crackle, hatch – four little chicks pop from their eggs of proud Mother Hen. Each one cheeps as expected except for Number 4 who says, “Chickabee.” This startles Mother Hen and the other chicks who insist that “Cheep” is right and “Chickabee” is not. But Little Chicken is not deterred and goes off to see the world. However, she finds that even the other farm animals insist that chickens say “Cheep” not “Chickabee” although when Little Chicken challenges them, they have no real reason why not. This is a charming story about difference, resilience, courage and perseverance and how these can lead to friendships, even unexpected ones. Beautifully illustrated by Danny Snell, this story works on so many levels. It would be a great read for classes early in this 2017 school year as new groups of children come together and learn about each other while even younger ones will enjoy joining in with the fabulous noises like rankety tankety, sticketty-stackety and flippety-flappity as they learn the sorts of things that are found on a farm. Given the trend throughout the world towards convention and conservatism and an expectation that everyone will fit the same mould and be legislated or bullied into doing so, Little Chicken could be a role model for little people that it is OK to be different and that no one is alone in their difference. This entry was posted on January 23, 2017, in Animal Stories, Belonging, Bullying, CBCA Shortlist/Notable, Chooks in Books, Emotions and Feelings, Identity, Inclusivity, On the farm, Picture Book, Review, Self Esteem, Special Needs, Teaching Resource.